I may have to log out again soon so I'll do the hopping a little bit later on. In the meantime, this is what I have been doing while waiting for my laundry earlier. Yep, with photobucket's help of course. I'm thinking of having the pictures framed as soon as I learn how to do that. So which one do you like better....the colored one or the greyscale one? Hello Mommy J. kumusta? I like both of the pictures here. Just passing by here to say hello. I am so busy lately at work that`s why I have not been here very often like I used to. take care! your family pic is cute and sweet:) i like it. beautiful family picture, i like both of them. it's thundering here and my little gurl is acting crazy for sure it will last for another couple hours before she gets over it. Actually we're still homeless. We're just living in the chilly cold streets of Edmonton (joke! corny din hahaha!). We're still staying with a friend's house. We're renting their basement because the apartment that we're going to rent won't be free until July 1st. It's kind of cozy here in the basement because it doesn't look like a basement at all. And I like it because I get to steal free wifi hahaha! It's all I need to survive (toink!). Hi there, I like the Greyscale one. That is a great picture. It rains all the time over here as well. Can't seem to get out of the house a lot these days. Anyway, the greyscale photo looks a lot better. Full of...drama? Sis, for me mas ok yung B&W. I'm back ... naging busy lang in preparation for the school opening. Have a great week ahead. the black and white photo is good for portraits purpose. what a happy family! stay happy! Hi Ate J. I love your family pic. So sweet. 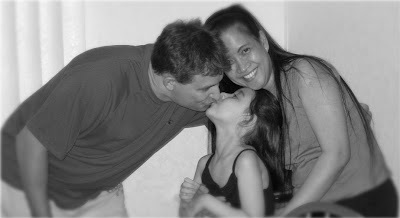 =) Your beautiful kid is very2x lucky to have parents like you and your hubby! i like the colored ones better. it's lively than the other one. greyscale but if you can photoshop it to make it sepia, better. Mas classic ya ing greyscale. Darling uyni apat no deng balik bayan boxes a pickapan da ngeni. Balamu ene mag balik dadala na ing egana gana, numg abalut nyang inda in g walmart ampong sams ibalut nya naman ay naku....nanu ini. Deng mitata ku buri da maka ternu lanaman. Balamu combo la,,LOLOL. i like both, but i like the black and white better. it's absolute classic! forecast dito rain daw asam2 ko pa ang rain wala nman! I like the colored one... Have a nice day! thanks for the visit.